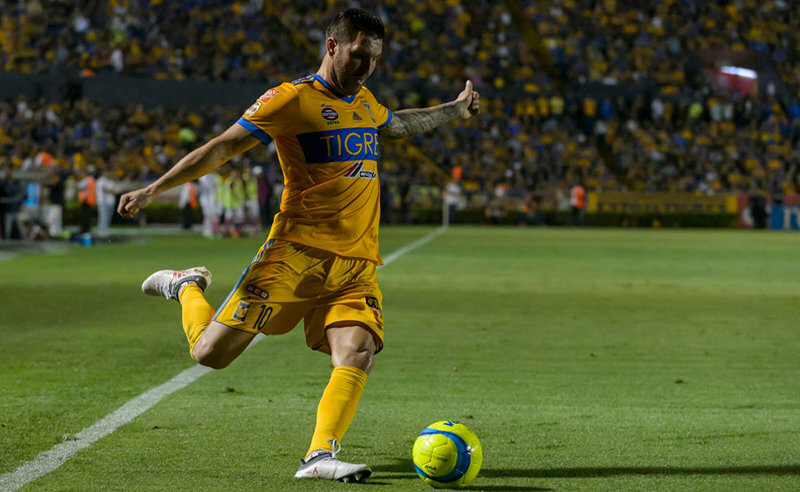 A recent article from Tom Harrison used data to assess some of the differences between football in Liga MX and Europe’s “big 5” leagues. Here, Tom goes into greater detail, illuminating a major difference between football across the divisions. All raw data in this article comes from https://www.sofascore.com, with the data adapted by Performance 100. Possession is one of the most hotly debated topics surrounding tactics in football. 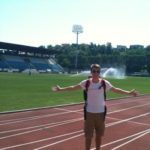 There is no best strategy towards dealing with possession, and no best strategy to win football matches, but the long-term trend tends to point towards possession-strong teams dominating domestic leagues, if not one-off knockout games. Manchester City, Bayern Munich, PSG and Barcelona are examples of sides that dominated possession and their divisions in 2017/18, whilst racking up huge goal tallies. These examples are limited, and after multiple discussions, a desire grew to look in more depth at the success of possession-based football in creating chances. This is particularly interesting considering that a large number of goals are scored following short possession sequences, and when the ball is won in the opposing team’s defensive third. Focusing on Liga MX, this study will specifically look to compare Mexico’s top flight with football in Europe’s “big 5” leagues, which are generally considered as the strongest leagues in world football right now. To begin this analysis, a study was done to compare possession figures with chances created, or key passes. One difficulty with such a study is that the two pieces of data are connected, as the more possession a team has, the more opportunities they have to create chances. Having more opportunities to create chances is significant, but this study aims to isolate the efficiency of different possession strategies. Therefore, to remove this bias and look purely at the efficiency of varying approaches towards possession, this study used Performance 100 data, which breaks down team and player actions per possession, rather than per 90 minutes. Therefore, chances created, or key passes, per 100 possessions have been plotted against ball possessions per 90 minutes, for each team in Liga MX, the Premier League, La Liga, Serie A, Bundesliga and Ligue 1, during 2017/18. The results are shown below. This graph displays a fascinating difference between Liga MX and Europe’s “big 5” leagues, with contrasting trends between key passes per 100 possessions and possessions per 90 minutes. For teams in Europe’s top divisions, there’s a very weak correlation, but overall a team became more efficient at creating chances as their possessions per 90 minutes increased. In Liga MX, the opposite is observed, and the correlation is stronger. To assess the correlations in more detail, let’s take a look at the correlation coefficient. This is a figure between -1 and 1, which indicates correlation. A figure below zero means the correlation is negative, with a figure above zero showing a positive correlation. Zero means no correlation, and the further away from zero the figure is, the stronger the correlation is. For example, -0.8 would be a strong negative correlation, with 0.2 a weak positive correlation. 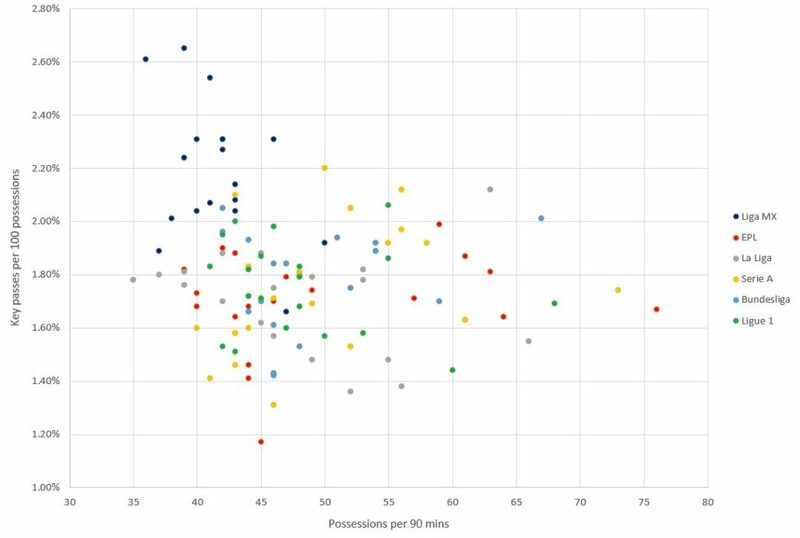 The table below shows the correlation coefficient between key passes per 100 possessions and possessions per 90 minutes for the six leagues studied, plus a Europe “big 5” figure. The correlation coefficients display a slightly different result. Whilst overall there is a weak, positive correlation across Europe’s “big 5”, differences are seen between the divisions. La Liga and Ligue 1 actually have a negative correlation, meaning teams in those leagues became less efficient at creating chances as their possessions per 90 minutes increased, but neither correlation is as strong as for Liga MX. One of the most fundamental and well known differences between football in Mexico and Europe is the concept of parity. Whilst the vast majority of leagues in Europe, and across the world, have massive clubs that dominate the league almost every season, Liga MX is different. The gap between the biggest and smallest clubs is small, and there is a possibility that the differing correlations are a result of variations in parity. The best teams in Europe almost always dominate possession across a league season, and create a large number of chances. This may have more to do with the best teams being so much stronger than their opponents, rather than their possession-based style being effective. To remove the potential bias of outliers, clubs that averaged over 60 possessions per 90 minutes last season have been removed, all of whom were mega clubs in their nations, and once again figured out the correlation coefficient for Europe’s “big 5”. The result, to two decimal places, was the same, 0.09. Therefore, differing levels of parity doesn’t appear to impact the correlation here. 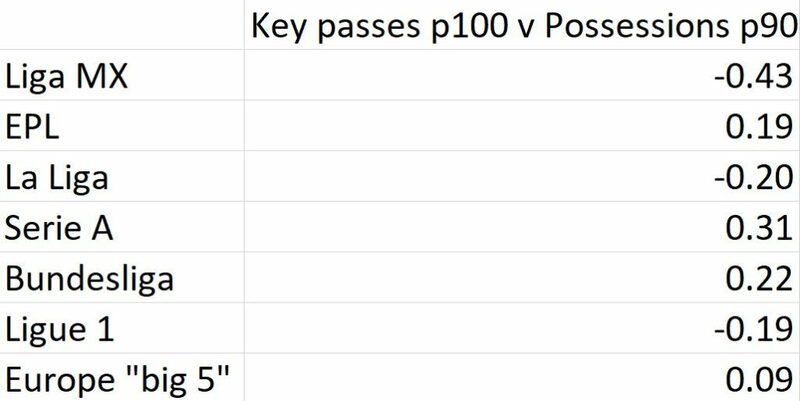 Key passes isn’t the only significant piece of data when assessing how effective a team is at creating chances. High key pass figures can be built-up by simply deciding to shoot at great frequency, even if the possibility of scoring is very low. Therefore, it’s important to assess big chances created, as well as key passes. Below is a table displaying correlation coefficient between big chances created per 100 possessions and possessions per 90 minutes. The results here are extremely interesting. In 2017/18, every top European league had a positive correlation between possessions per 90 minutes and big chances created per 100 possessions. The correlation for the Bundesliga was particularly strong, and across the “big 5”, the correlation of 0.41 is significant. Whilst in Europe the correlation became considerably more positive in comparison to key passes per 100 possessions, Liga MX barely changes, from -0.43 to -0.42. 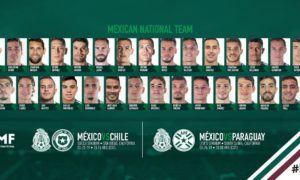 In complete contrast to Europe’s “big 5”, having more possession Mexico’s top flight last season tended to reduce a team’s efficiency of creating big chances. This suggests a fundamental difference between football in Liga MX and major European divisions. However, we must once again check whether parity has had an impact. After removing teams with an average of over 60 possessions per 90 minutes, a major difference is found. The correlation coefficient across Europe’s “big 5” drops from 0.41 to 0.16. A massive reason why the big clubs in Europe are so dominant is their efficiency at creating big chances. 0.16 is a weak correlation, and suggests that away from the mega clubs, approaches towards possession isn’t a massive determinant of success are creating chances. However, the correlation still contrasts to that of Liga MX clubs in 2017/18. So why might this be? In a recent article I explored the current lack of tactical diversity within Liga MX and some of the dominant tactical trends. One of these trends is the free-form positioning of attacking players. Most teams have their defenders adopting rather strict positions when building attacks, within a 4-2-3-1 or 4-4-2 this is usually split centre-backs, a defensive midfielder dropping back (la salida Lavolpiana) and full-backs pushing higher and wide. However, the majority of coaches give their attackers given license to roam. Without positional structure in attack, “wide” players spend the majority of the match drifting infield, and as most Liga MX full-backs don’t push up as far as the opposing box, there’s often a lack of width when attacking. 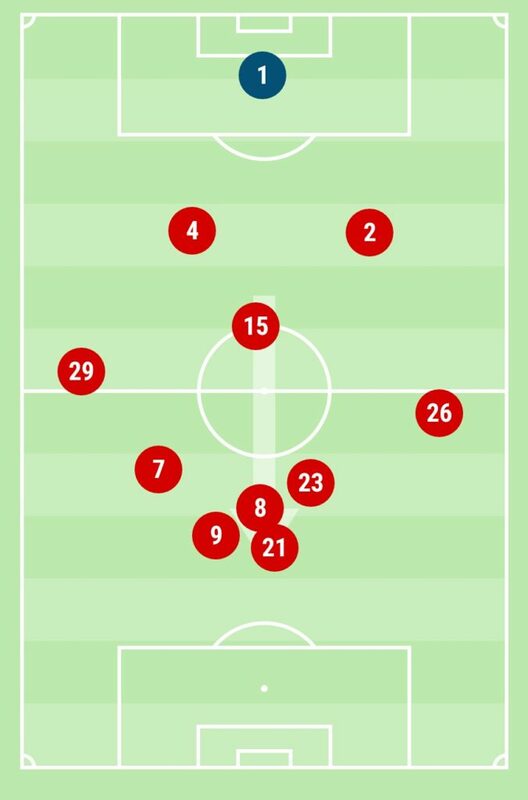 Toluca’s average position map for their recent win versus Santos is highly typical for Liga MX. The back five (outfielders) are well-organised, with the rest of the side having freedom to roam. This usually results in most attackers around the middle of the pitch on average. Graphic via the Sofascore app. In Europe, a different style of play when building attacks is often observed. Understanding the need for width to stretch organised, compact defences, and the option to switch play if pressed into a tight area, many coaches demand more structured positioning from the whole side when building attacks. Width is often provided by overlapping full/wing-backs as inverted wingers cut inside onto their stronger foot, but there’s also been a revival of the “old-fashioned” winger at Pep Guardiola’s Manchester City. One excellent method of observing the differences in attacking structures across leagues is by looking at average position maps and player heat maps. By using the Sofascore app you can see and compare average positions of teams in matches across multiple leagues, and normally the structure of a formation is significantly more structured, and therefore easier to decipher, from games in Europe’s top leagues to Liga MX matches. Possession-based football usually gives your opponents the opportunity to drop back into an organised, compact, defensive shape. Width and positional play when attacking (juega de posición) is seen as an important part of being able to break down organised, compact defences, as the defences have to be stretched in order to create gaps between players. Therefore, the lack of width and positional structure from most Liga MX attacking units may explain why possession-based sides are less efficient at creating chances than teams that prefer to have less possession, and hit opponents on the counter. An example of a Manchester City average position map last season (taken from their 1-0 home win v Chelsea). 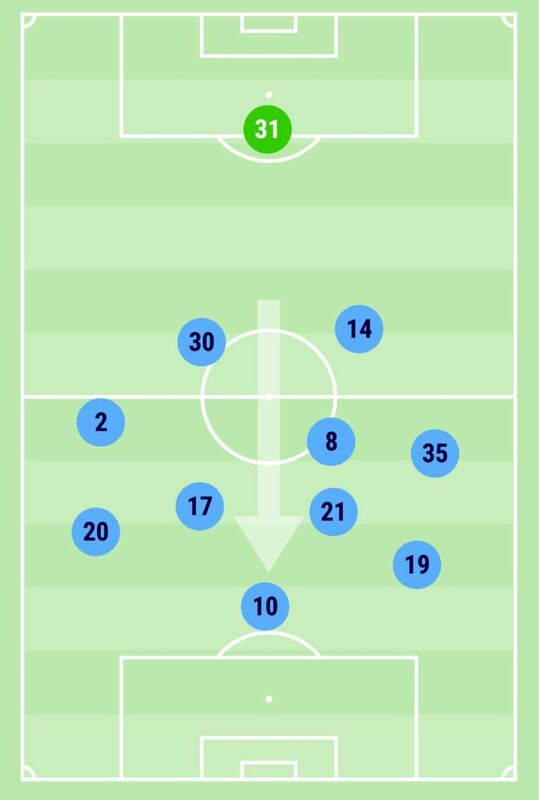 The back five outfield players are similarly positioned to Toluca’s, but the front five completely contrast. There is evidently more structure, more width, and each player seems to have their own zone to work within. Graphic via the Sofascore app. Speed of possession play may also be impacting the success of possession-based football in Liga MX. A study from 2016 found that on average Liga MX teams move the ball around 5.9% slower than their counterparts in England and Germany. Quickly moving the ball whilst in possession is another important part of breaking down compact defenses. The more time the opposing defence has to react to the movement of the ball, the more chance they have to organise and become compact, making chance creation more difficult. 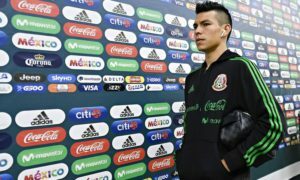 Another possible factor could come from the defensive structures, specifically pressing, within Liga MX. Many Liga MX teams play matches at high altitude, and plenty of games are played in hot conditions. This, particularly the altitude, contrasts greatly to the environments within Europe’s “big 5” leagues. With less oxygen available, pressing is more difficult, and as a result, Liga MX teams are less able to compact the game. A more open game makes counter attacking easier, offering a strong possible reason behind the success of less possession-based teams in Liga MX at creating chances. 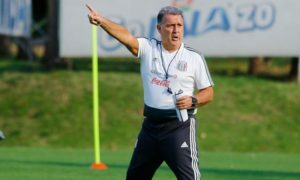 A lower level of tactical development in terms of pressing could also be a significant reason behind the openness of football in Mexico, alongside the environment. A recent study found that teams in Liga MX had more attacking output (shots, crosses, dribbles) per 100 possessions than their counterparts in major European divisions, and this is reflected here as the top eight teams for chances created per 100 possessions are all Mexican. This backs up the suggestion that less developed pressing in Liga MX leads to easier chance creation. There is also a possibility that the data simply represents a seasonal trend, rather than a long term correlation. Last season direct sides Monterrey and León were extremely efficient at creating chances, whilst under Rafael “Chiquis” García’s possession-heavy style, Puebla were highly inefficient. These sides certainly impacted the correlation, and may simply be a result of the quality of players for the sides. Were Monterrey and León extremely efficient at creating chances because of their direct approach, or because the trio of Avilés Hurtado, Rogelio Funes Mori and Dorlan Pabón, and the Elías Hernández-Mauro Boselli partnership were just so good? Difficult to say, but assessing the data once again after future seasons should help to answer this question. There’s always a danger in taking too much from a season’s worth of data, but if this correlation continues over the longer term, there are major consequences for Liga MX coaches and their tactical decisions. Counter attacking appears the most effective strategy for creating chances in Liga MX right now, but if a team was to successfully implement a more structured possession-based approach, whilst reducing the number of counters that they face, they could be highly successful.